Just when you thought there was nowhere new to go with avocado toast, along comes Oppen. The Scandi-style cafe specialises in smorrebrod (say “smairbrud”), a Danish open sandwich on rye, generally smeared with butter and topped with herring, cured meats, pickles and other such delights. Smorrebrod started as practical workingman’s fare but are now often quite dainty and fancy, the kind of edible still life that demands a knife and fork. 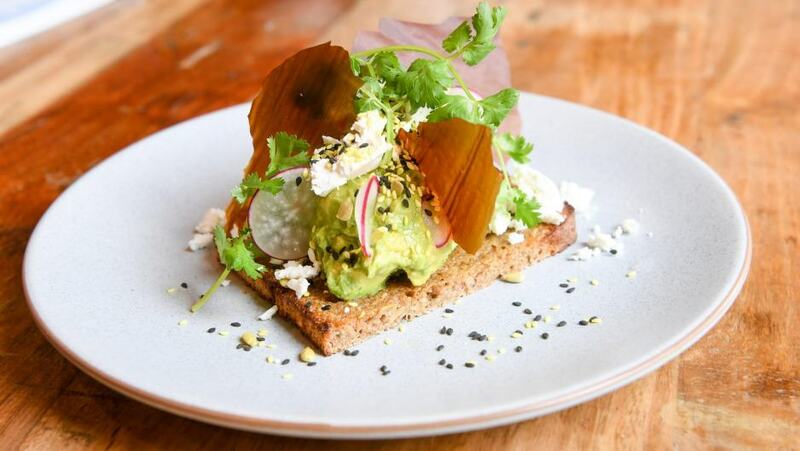 At Oppen, while the inspiration is Denmark, the menu is a marvellous Melbourne mash-up so there was no doubt avocado had to make an appearance. The mortgage-buster is mashed, dolloped over toast, then further dressed up with feta and dukkah. So far, so cafe, right? But then it gets radical. Vegemite and avocado are BFFs – the spread’s salt and the avo’s creamy sweetness play so nicely. Yet Oppen does not merely scoop black gold out of the jar. Instead, they take it up a notch or five by spreading the ‘Mite super thin on baking paper and dehydrating it for three days, thus transforming inky sludge into translucent black shards. These paper-thin slivers are showered over the whole shebang, bringing visual excitement and crisp, textural play to a classic flavour combination. The bread deserves attention. It’s a house-made loaf of 70 per cent rye and 30 per cent spelt, making for a lighter than traditional slice. Sunflower and pepita seeds add extra body. 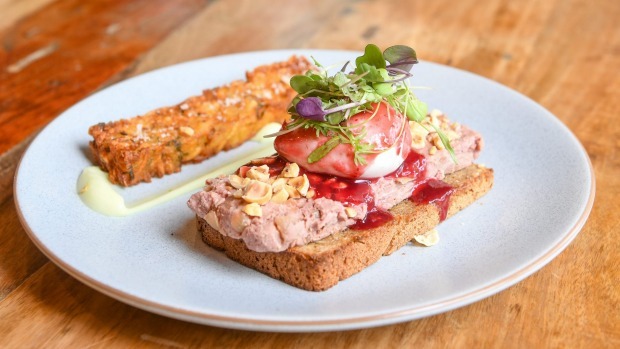 Some sandwiches ply traditional lines, like the one with rich, creamy pork liver pâté, smothered with lingonberry jam then topped with a poached egg (very Melbourne; in Copenhagen you’d get a boiled egg) and toasted hazelnuts. It’s an extremely satisfying balance of crunchy and rich, wholesome and indulgent. Owner and chef Zume Pham came to Australia from Vietnam four years ago to study mechanical engineering. It’s fair to say that opening a fancy sandwich joint was not on his radar but – as can happen – Melbourne’s vibrant hospitality scene saw him swerve into a career as a chef. 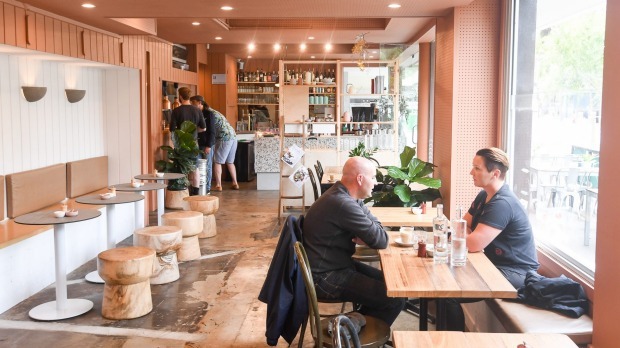 Last year he married designer Amy Vo, a fellow Vietnamese immigrant, and it was during their honeymoon in Scandinavia that they identified a smorrebrod-sized gap in the Melbourne cafe scene. Oppen opened just before Christmas; the design is calm and clean and the location, next to Windsor Station, is an off-Chapel Street oasis. 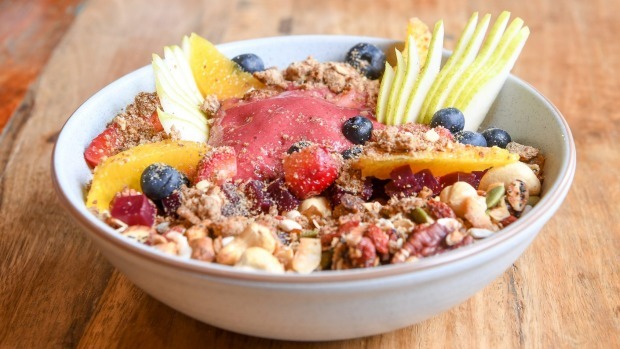 Beyond the stuff on bread, a free-floating Scandinavian influence is also seen in the granola, a pleasantly savoury blend of nuts, seeds and grains that’s served with fabulous sour cherry foam, skyr – a sour Icelandic yoghurt – and ymerdrys, a sweetened breadcrumb. So many mueslis are sweet mush; this one is great. Skyr also keeps a delicious rhubarb and “apple pie” smoothie light and fresh to the bottom of the glass. Other dishes bust free from geography: the burger is a nicely made tower of indulgence with juicy wagyu patty, smoked cheese and an oozy truffle-spiked sauce. When I’m told Melbourne doesn’t need another cafe, I tend to agree. Surely there’s one for each of us now? On the other hand, when spirited citizens keep founding original, pleasant and friendly places, I can’t help but Oppen my arms. First published in Good Food, 25th February 2019.